For some background of the M-ATV program, look here. 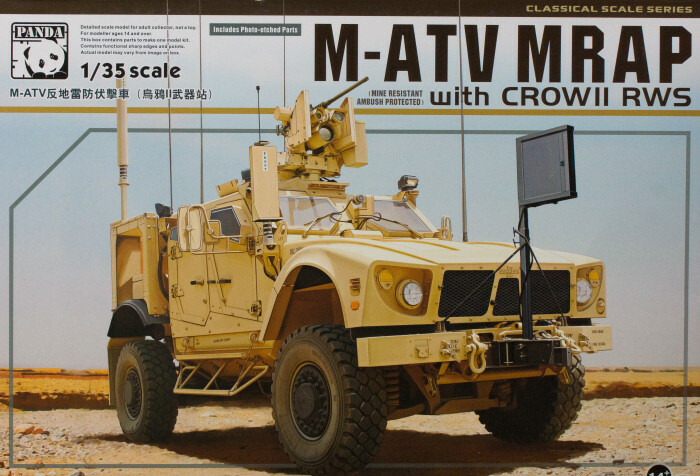 Here is Panda Hobby's first subject, the Mine-Resistant Ambush-Protected (MRAP) All-Terrain Vehicle (M-ATV). Rather than being a simple reissue, Panda Hobby has provided a different version, replacing the manned turret with the Common Remote-Operated Weapons System (CROWS). The kit is molded tan styrene and presented on 12 parts trees plus separate cab and hood, two trees of clear parts, three frets of photo-etched details, and five rubber tires. While it would have been nice to have mission electonics included in the kit, I remember from the full-scale program that there were over 20 different mission electronics configurations defined for this vehicle and that would have caused some interesting stir among knowledgable modelers given that there would have been a very good chance that the version they wanted was not included in the box. There are some aftermarket options for mission electronics though one of the better options is located in the EU and insists on charging non-EU shoppers with EU (VAT) taxes - no thanks. This is still a nice kit and with the addition of CROWS, it provides some interesting variations over the original release. Grab one and have some fun! My sincere thanks to Panda-Hobby for this review sample!